Northern Ireland retailers have said they feel under siege and are asking if they will be next to fall victim of the recent spate of ATM thefts as police appeal to the public to be their “eyes and ears” in their crusade to put an end to the robberies. The PSNI has established a special task force of detectives to investigate the incidents and have upped patrols at “vulnerable and high risk” locations. There are concerns among retail groups ATM providers could decide to remove machines from rural areas, potentially leaving communities without access to a cash machine in their area. “I feel reassured that the PSNI is stepping up their investigations and the number of patrols,” he said. “Our members are being ruthlessly targeted by these criminal gangs and feel under a state of siege. As we approach the weekend Retail NI members are asking themselves will they be next. 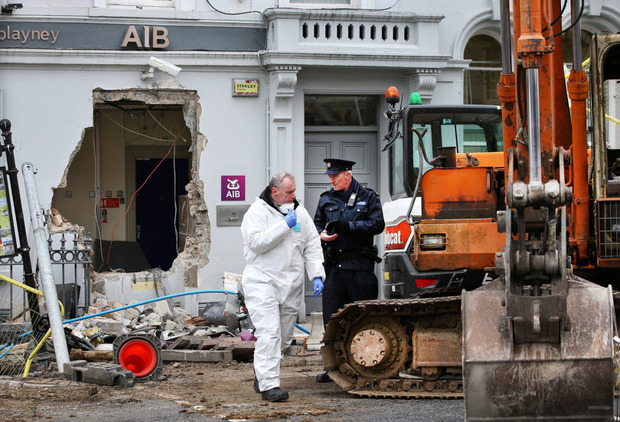 Cash grab: Gardaí at the scene of the ATM raid in Castleblayney last week. “No small business owner should ever have to face such a threat. We are urging the community as a whole to be vigilant and to stand with our members in these challenging times. “It is not possible for our officers to be everywhere at once and to predict where these criminal may target next. We need communities to help be our eyes and ears,” said Detective Chief Inspector David Henderson. Detective Chief Inspector Henderson added: “If you see activity overnight in or around building sites, report it immediately. Owners of plant machinery, please secure and lock up your equipment, and please consider installing immobilisers – at least one digger theft has recently been prevented because of one.